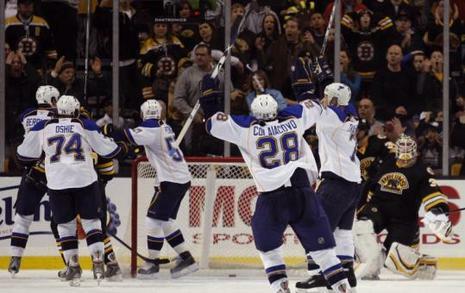 With repeated chops of his right hand, referee Rob Martell pointed to the Boston net and ruled that yes, a last-second swat by David Backes had crossed the line before time ticked off, and yes, the St. Louis forward had batted the puck in without lifting his stick over crossbar height. The record will show that yesterday, the Western Conference's worst club beat the best in the East. The Bruins, however, are far from the juggernaut that rolled through a 10-game winning streak and ticked off 14 straight victories at home earlier this season.